Have you heard of EFT (emotional freedom technique) or tapping? It not, you could be missing out on the opportunity to release your negative beliefs about financial abundance and wealth. If you’re like most people, you learned your money beliefs from your parents. If your parents were raised with a ‘lack’ mentality, chances are they passed this ‘stinking thinking’ onto you. If you have kids, you may have passed it onto your kids. The cycle continues until someone breaks it. And that someone can be YOU! Forgive your parents because they had no idea that their beliefs, thoughts, and words created their reality. Some people believe that money changes everything about you and your life but not in a good way. This is why their financial future may be unstable. For example, you may believe that money makes you arrogant and rude. However, if you had more money, you could make a difference in lives of thousands, perhaps even millions of people. You could begin with your family and friends. Money is nothing but energy and paper and coins. But, you may give money absolute power over you. Instead of being a money master, you’re a money servant. You let it control your emotions, thoughts and beliefs. You let it stress you out whenever your bills are due. This isn’t healthy. Instead of worrying about money, which only gives you more issues to worry about, make peace with money. You may think that you’ve found Mr. Right, but think again. Because love can be blind, and you ignore red flags that you’re about to marry the wrong man. Let’s face it; when you fall in love, you’re on cloud nine and thrilled that you’ve found a partner whom you can spend the holidays such as Valentine’s Day with, someone to snuggle up to on a cold night. But, do you know your man like you think you do? How well do you know his family? 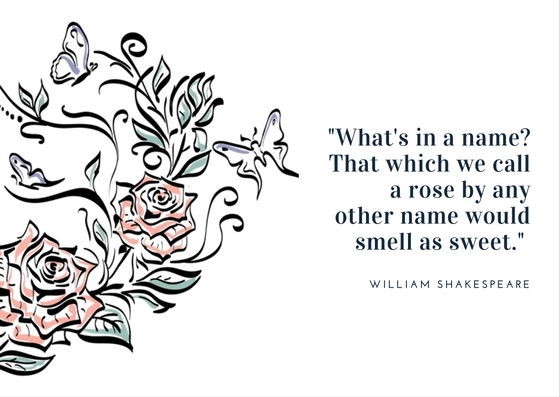 In the beginning, your relationship may be sugar and spice and everything nice, but as you get to know each other, you may see your significant other in a different light. Before you walk down the aisle and say “I Do,” check out the warning signs that you’re about to marry the wrong man. Save yourself from heartache now rather than later. 1. He’s a mama’s boy. You may think it’s admirable that your fiancé’s mother cooks and cleans for him, but what do you think will happen when you’re married? That’s right. You get to pick up where his mom left off. Do you want to be a wife to your husband or a mother? After all, you’ll most likely work 40 or more hours per week, like your husband. Shouldn’t there be equal household responsibilities? 2. He has control issues. When you want to get your haircut, does your guy give you hard time? What about when you want to spend time with your friends? Does he insist on going with you? These are a couple of signs that your guy has control issues. Think twice before you get married, because control can turn into physical, mental and emotional abuse. 3. He will only hang out with his family and friends. Ever notice how you spend most of your time with your fiancé’s family and friends? When this happens, your family and friends will feel neglected. Have a chat with your man and make it clear that there has to be a balance between hanging out with both sides of the family and both sets of friends. If he disagrees, you may want to rethink his proposal. 5. He puts you down in public and private. Do you want to marry someone who treats your like dirt and doesn’t respect you? When you’re married, do you think your husband will stop insulting you? Maybe, if he seeks counseling. Then again, maybe his family has a pathology or history of abuse. Perhaps he saw his mother treated horribly by his father. Think about the kind of marriage you’ll have. Think about the kind of marriage you deserve and want. 6. Your future mother-in-law runs his life. Do you notice how your man has to call his mother when he gets home from work or a night out with you? Does he discuss his finances with his mother and allow her to make decisions about his financial future? If you think this will stop when you’re married, you could be in for a rude awakening. How much do you want your mother-in-law involved in your married life? 7. His finances are out-of-control. Have you discussed finances? For example, does your guy have credit card debt that he’s not paying off? Does he have a checking and/or savings account? How about an investment portfolio? Before you commit to marriage, discuss finances. You want to create a solid financial future together as husband and wife. Think long and hard about entering into a marriage that’s riddle with financial catastrophe. You don’t want to ruin your credit, do you? 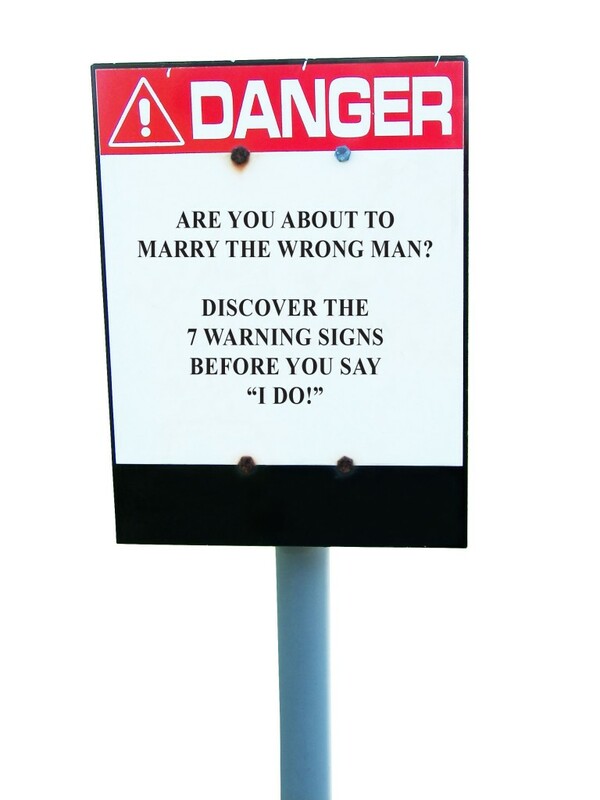 The seven warning signs you’re about to marry the wrong man. When you notice red flags about the man you’re about to marry, think about if you want to get married. Have a conversation with your fiancé because it could save you time, money and possibly your life. Don’t feel bad if you want to call off your wedding. You won’t be the first woman to give an engagement ring back. It’s better to say, “I Don’t,” rather than to say “I Do” to a lifetime of misery. How I Met Your Mother is one of my favorite TV series; I can’t wait for the finale to see how it all ends. Who are we kidding? The show will live on in re-runs and on Netflix! On January 27, 2014, during the 200th episode of How I Met Your Mother, fans were treated to an episode that was all about The Mother. Viewers found out The Mother’s boyfriend died and she decides that she’ll never find another love like the one she had. The Mother meets her former music teacher and they go back to her apartment. He thinks he’s getting lucky and takes off his clothes while she gets her cello. She walks into the living area and is freaked out and thinks he’s turning into a creep. The music teacher grabs The Mother’s cello and hides his manhood. The Mother tells her former music teacher that she feels lost and stuck. Lucky for her, he felt the same way she did. He tells her that he discovered what he truly wanted to do, teach music, while hitting rock bottom and living in his parents basement. 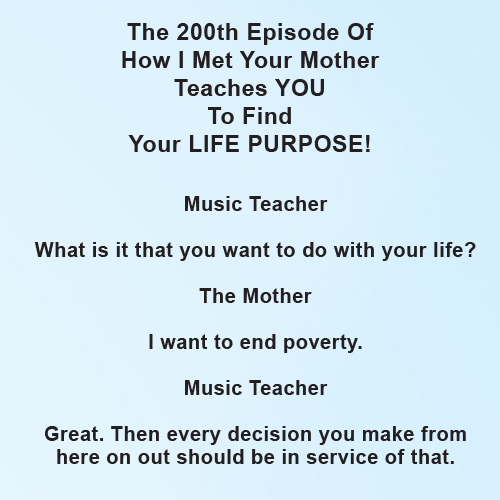 Check out the dialogue below between The Mother and her former music teacher. What is it that you want to do with your life? I want to end poverty. Great. Then every decision you make from here on out should be in service of that. It’s that easy to discover your life purpose. Stop over thinking what you should or shouldn’t do with your life. What to do When You Find Your Life Purpose? Once you discover your life purpose or reconnect with your dreams, don’t share what you want to do with people who’ll put you and your life purpose down. Guard it with our life. If you feel the need to share your life purpose, only share it with those who support you, no matter what. If you need to take classes, sign up for them. If you need to move, then move. If you need to release people from your life who no longer resonate with you and your life’s path, gently say goodbye. Embrace your life purpose with every ounce of your being. Visualize yourself following your path and doing well. Know that all is well and that you deserve to be happy and do what you want to do that brings you and others joy. Over to you. Have you found your life purpose? If so, how did you discover it? Let me know in the comment below. You get to wipe the slate clean, start over and live a better life. Of course, you can create and set goals. For example, my goal is to post more frequently on MisticCafe. I kind of took a break because I’ve been developing my writer’ website and writing projects. However, I want to get back to writing consistently for MisticCafe. 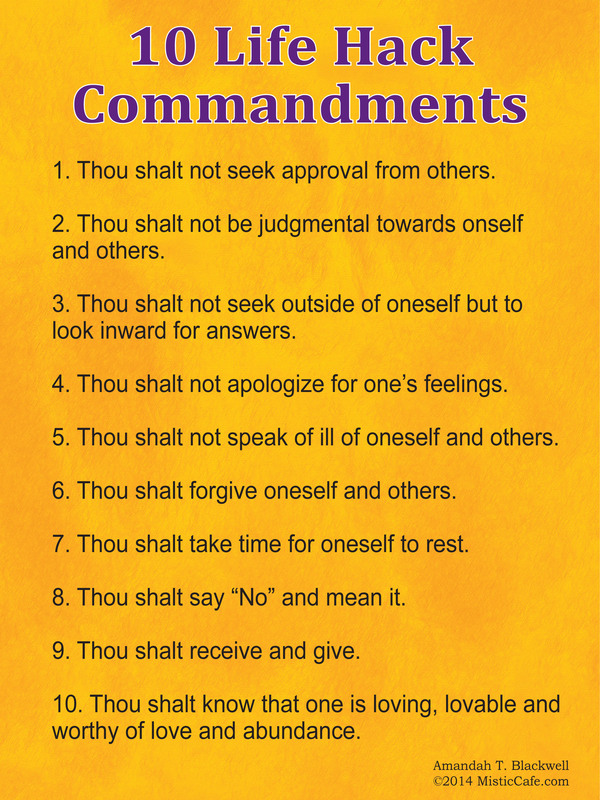 While I was meditating, I had the idea of “Life Hack Commandments” pop into my head. I told myself to remember the idea so I could write it down later. Without further ado, here are 10 life hack commandments you can use every day. I created an infographic for you to download. 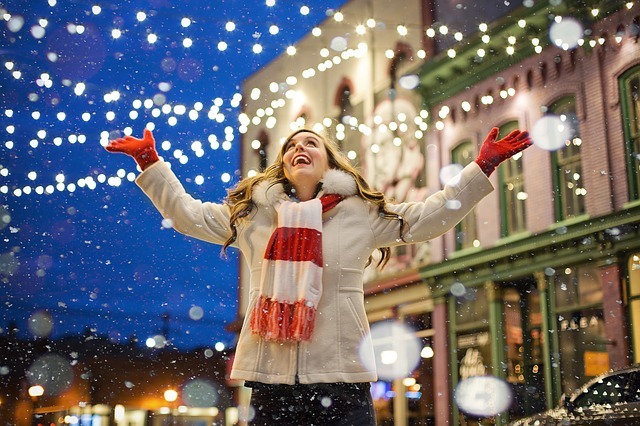 Let’s make 2014 a fantastic year. Just take one day at a time and enjoy the present moment. Over to you. What other Life Hack Commandments would you add to the list? Let me know in the comments below. Fears and doubts have a tendency to creep inside your mind and fester and grow. The good news is that you have the power to shrink your fears and doubts with the wave of a magical wand, real or imagined.